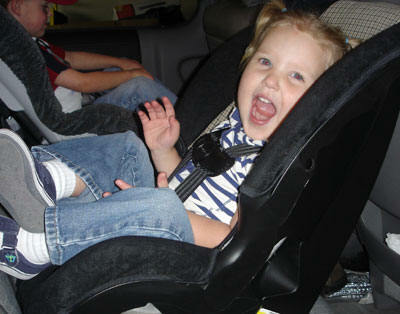 Sidney rear-facing in the Cosco Scenera at 2 years, 5 months. She weighs about 32.5 lbs. Sidney rear-facing in the Britax Roundabout at 2 years, 2 months old. Sidney weighs 31 lbs. Sidney rear-facing at 1 year, 7 months (19 months), and 28 pounds. 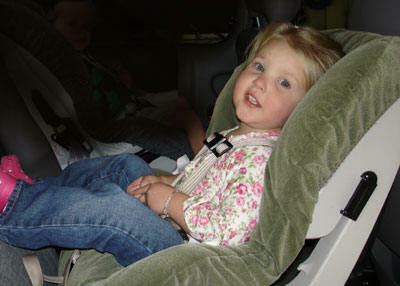 She is in a Britax Roundabout that is installed using LATCH and is tethered. Note: The shoulder pads shown here are not recommended by the manufacturer. 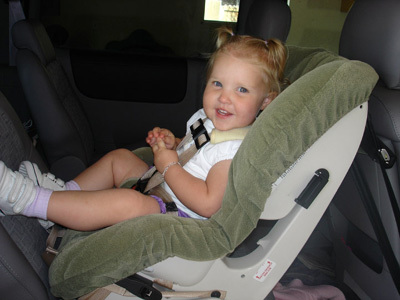 However, Britax does make shoulder pads for their other seats (Marathon, Decathlon, etc.) that they have approved for use on their seats.